With the NEW Duplo DF-850, you can quickly and efficiently fold paper for any need. Whether you need to make brochures advertising a service, fold invoices or letters to mail for customers, make bulletins for your church or event, or anything in-between, this paper folding machine can help. This powerful paper folder will handle various paper sizes from as small as 3.59" x 5.04" up to 11.7" x 17", so you can easily fold all of the most popular sheet sizes. It will run at speeds up to 240 sheets per minute, depending on the paper stock and fold style; compare that to how long it takes to hand fold currently...what an amazing difference! The Duplo DF-850 has a feed tray capacity of about 500 sheets of paper, which is higher than many other comparable models. The larger feed tray means you can spend less time re-filling and more time working. To use it, simply set up the fold type you want. You can use one of the 6 pre-set fold types, or customize the fold to fit your precise needs. Once you're ready, load the paper into the feed tray and press the test button to test the fold. It will fold two sheets. Inspect the sheets for accuracy and make any necessary adjustments, then test again. If no adjustments are needed, then press start and let the DF-850 do the rest. Walk away and perform other tasks while it automatically folds your pages. Folded sheets are released into a neat row on the exit tray. 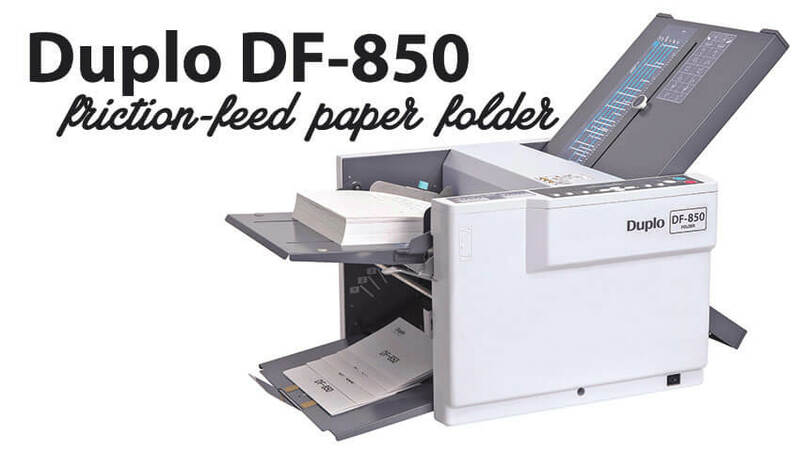 The Duplo DF-850 is a friction-fed paper folders, which means that it uses rollers to grab your pages from the feed tray, and pull them through the folding plates. This means that it is not suited for most coated paper stocks, as the rollers can sometimes leave marks. For that kind of printed media, you should look into an air-fed paper folder instead. It is rated to handle many paper stocks up to about a 41 kb. bond or 157 gsm, including some coated papers. With the Duplo DF-850, you can eliminate the hassle, strain, and time-consuming task of hand folding high volumes of pages. It retails at about $2,500 (contact us for a special price!) and is perfect for your higher volume paper folding needs, such as those for a business, church, or school. Question? Give our experts a call at (866)537-2244 (866)537-2244 . Or you can click here to learn more or buy the Duplo DF-850 online. You can also download the PDF sell sheet here.